Jimbo Johnson (1968 – 2017) born in Derby, was brought up by the elder brother of Rusty Peters and Rammel Peters. His mother and father were stock workers who travelled to many different stations to work. J.J. went to school in Halls Creek and would follow his parents to whatever station they were working at for his school holidays. When he was old enough, J.J. also began station work and he remembers working on around twenty different stations in the Kimberley and the Northern Territory. Eventually his parents settled in Warmun Community. J.J. began painting at Warmun Art Centre in 2005. 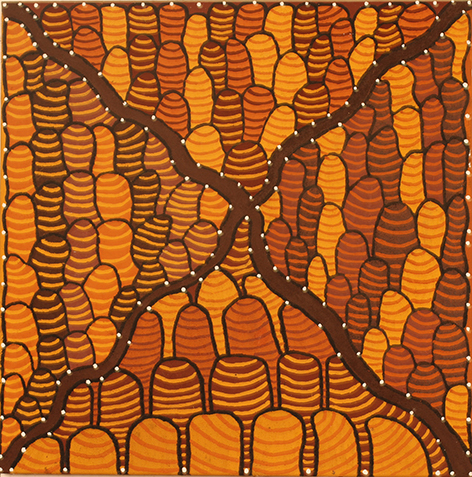 He was married to Warmun artist Jane Yalunga. Three of their children Coralee, Lazarus and Cody are also keen painters. J.J. took as his subject matter country and Ngarranggarni (Dreaming) stories from around his home in Warmun. He was also known for painting many of the animals found in Gija country as well as aspects of hunting such as traditional tools and weapons. J.J. often took his family on fishing and hunting trips to the country he painted. He had developed his own distinctive style and approach featuring large areas of dotting in varying colours. His individual style helped set him apart from other artists in his community. J.J. became an accomplished young Warmun artist.